We introduced our formal place setting last week and now we want to share our casual place setting. We love our Waterford Brocade china setting and the Lismore Essence crystal stemware. We are equally in love with our casual settings! I mentioned in that post that couples have a hard time finalizing a pattern. We had a lot of problems selecting casual place settings. 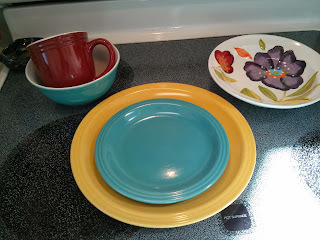 Much like our fine china, where Patrick liked a favorite pattern from the beginning and I came around to it, we had a similar dilemma for the casual dishes. I loved the Denby Halo pattern but Patrick didn't like it. Then over the course of a good 4-6 months we went back and forth with casual dishes. Should we do white? Should we do stoneware or porcelain/bone china? I found a lot of things just weren't "calling" to me. I didn't want Fiesta which is Macy's Registry #1 pattern. I really liked the Villeroy and Boch brand but none of the patterns seemed quite my style. For a bit we were leaning towards Tin Can Alley from Lenox (a white bone china) but something just wasn't right and held us back. Finally Patrick came around to Denby's Halo pattern. He probably just didn't want me to ask him anymore which dish he liked best! I just love it! I love the glazed pottery elements and the contrast of the blues. It has pattern but it's not too crazy and has enough color that it's not plain. And I think Denby produces a great product. The company has been producing quality stoneware in England for over 200 years and production hasn't moved (ie it's still made in England!) so I know we have good stuff. We weren't too thrilled with the place setting. The dinner plate is huge (comes in at 11 inches!) and we weren't big fans of a cereal bowl. Before I tell you more about the Denby here's a reminder of what we upgraded from. Our colorful set was from Target and was purchased when Patrick moved in to his bachelor pad three years ago. They were sold in 16 piece sets in various colors. We had three sets (service for 12) in yellow, teal, and red. We added the pasta / soup bowl shown in the right corner to the collection. This pasta bowl really surprised us. We use it more than the cereal bowl which led us not to choose the Denby Halo place setting but rather to register for open stock. Fortunately Denby has three plate options: 11" dinner plate, 9.5" salad plate, and an 8" tea plate. Since we weren't pleased with the large 11" dinner plate, we registered for the salad plate as our dinner plate and the tea plate as our salad plate. We did not register for any of the cereal bowls but rather the rimmed soup bowl (below, left). Finally we completed our set with a combination of mugs that are in the place setting and teacups and saucers (below, right) because they're fun. Patrick finally admits liking the Denby Halo. 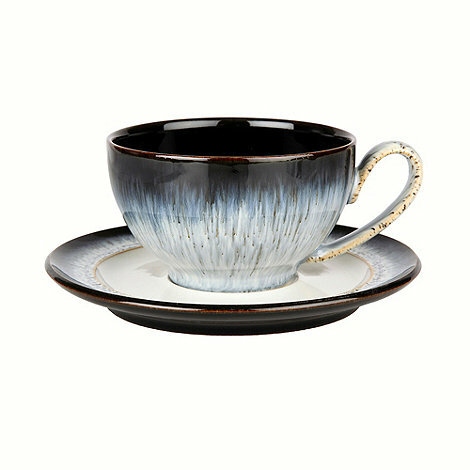 Another thing we like about the pattern is, since it's all hand glazed, the pieces vary and have their own personality. Some of the dishes have more blue while others have more dots or lines. I wasn't quite able to narrow down my choices when we were picking the casual china and finalize a selection. This is how we came to end up with a set of white bone china. We registered for the Gorham Boulder Creek 40 piece set. This set fills in where the Denby set is missing. It has cereal bowls and more mugs. It also has a bread and butter plate. The 40 piece set includes 8 five piece place settings. Boulder Creek is a more modern plate as well. I describe it as a hybrid between square and round plates. I couldn't give this set up because in the back of my mind was Granny saying "white dishes will go with everything!" Another reason I justified the second set was I knew I wanted 12-14 place settings. When we registered for the Denby we chose to only do 8 place settings and then have the Boulder Creek set. Had we chosen not to register for the Boulder Creek set we would have increased our settings on the Denby. I'm glad we made the decision we did. We have fun using both sets but we've also found the white bowls and bread & butter plates to be versatile with kitchen prep. And since the white set is bone china it's good quality. So we've got stuff to eat on; now we need stuff to drink with! The glasses we were using were also purchased during Patrick's Target trip to stock his bachelor pad. At some point over the last three years I had stopped in Target to add to the set. 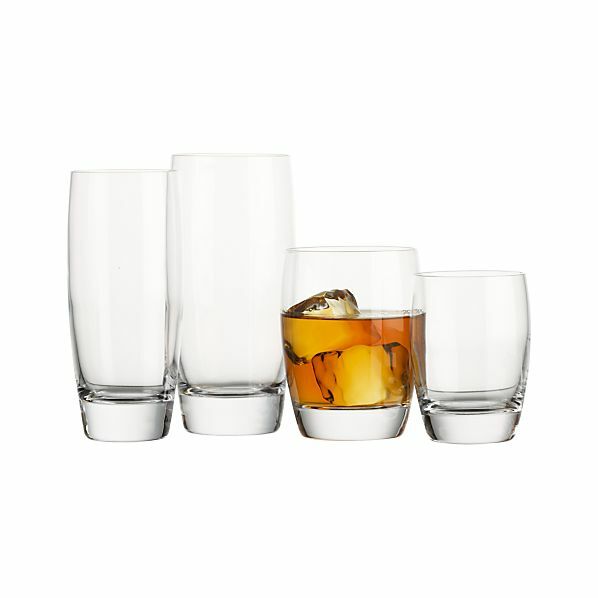 We originally had sets of 6 highballs / all purpose glasses and double old fashioned / juice glasses. But Patrick had dwindled that down to only sets of 5 for each set. Unfortunately I was not able to find the same pattern again at Target. This is one of the downsides of registering at Target or other stores that seasonally change stock: if you don't get what you want when you see it, it might not be there again. This is a big factor I make sure couples are aware of. Registering for tabletop ideas at stores like Target, Crate and Barrel, Pottery Barn, and the likes will give you lots of popular trendy options but they will rotate their patterns and before you know it your pattern will be discontinued. By registering at a department store and choosing name brand items like Lenox, Waterford, or Fiesta you are guaranteeing that your pattern will be available for a good amount of time short term (some even longer). You'll pay a little more for the name brand items but the security to know you can add to your pattern is worth it. Now back on track and not finding glassware means we needed to register for more! I know I just said registering for tabletop at Crate and Barrel is bad but it's only bad if you're unprepared. I would definitely steer away from china and stainless flatware from there but glassware is okay. I say this because china and flatware are a bit pricier so if you don't receive everything you asked for on your registry, you might want to add to it over the next few years but you will not have that option if you chose a pattern from Crate and Barrel. Glassware however is a bit cheaper. The glasses we registered for at Crate and Barrel range from $4-6. Most of the glasses average around that price and the majority are under $10 a piece. If these happen to break we can use them until they're gone and then add to the collection if we can or replace the collection. We chose the smaller of the two options below in the Crate and Barrel Otis collection. We registered for the all purpose glass on the far left and the juice glass on the far right. So we've got stuff to eat on and stuff to drink with; now we need stuff to eat with! One of the first things I learned working at the registry desk is that 18/10 stainless steel flatware is the best quality. The two numbers represent the metal alloy: 18% chromium and 10% nickel is in the stainless steel. Together the chromium and nickel prevent corrosion, add luster, and have a durable construction. You might can imagine Patrick's trip to Target for his bachelor pad included some non 18/10 stainless flatware which is why we needed to upgrade. Non 18/10 stainless tends to show rust spots over time as you put it through the dishwasher. True to form, finalizing a stainless steel pattern proved taxing. We debated quite a bit back and forth. I can't remember which one of us selected this one. Finally we both agreed that the Lenox Vintage Jewel pattern was the one for us. It has traditional elements but not too traditional that we felt like it still represented us as a young couple. We feel like the texture goes well with the Denby Halo pattern and also jazzes up the white Boulder Creek set. And we also feel like we can transition this to our fine china. Wins all around! I know realize I should've titled this post "Everything we upgraded from Patrick's 2010 trip to Target for his bachelor pad"... which brings me to one other registry recommendation: if you are in a serious relationship and replacing / starting a kitchen whether you are living together or not, start investing in quality items together.